Shipping $6.75 Add item to cart for shipping estimate. You can SAVE on shipping by buying multiple items from the same seller. Shipping is charged by each individual seller. Sellers at times may also provide FREE SHIPPING on select items or on entire order if it meets the minimum order value. Please check sellers page for more details. Let's keep next generation close to our tradition and culture by starting to dress them up in this traditional wear. Which is one of the age old myriad tradition in our Indian culture. Adorn her with a classy style statement for festivals , wedding ceremonies, temple visits or any special occasions with this ethnic set that will make your princess look adorable. All our dresses are made carefully out of high quality fabrics and stitching which is comfortable to wear for kids for any occassion. Shipping Cost $6.75 Buy multiple items online from Elegant Attire to SAVE on shipping. This item in Pattu Pavada for Kids category was first added to our catalog on 06-15-2018. 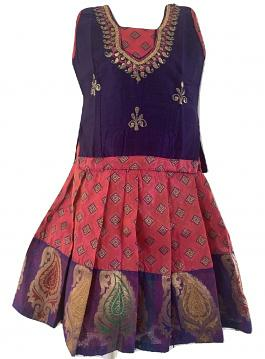 Buy Baby Girl 6 Mths to 2 Year Pink & Blue Pattu Pavada Parikini - Size 14 & 16, sold & shipped by Elegant Attire where you can shop online for Bespoke Designer Indian Fashion Clothing for Girls and Women. This Baby Girl Pattu Pavada collection has been tagged as Pink,blue,pattu Pavada, Infant Pattu Parikini, Babies Traditional Dress, South Indian Outfit,. thank you for shipping the ram-leela dvd so fast. The picture and sound quality was great.